For 34-year-old Greg and 35-year-old Erin, running is central to their relationship. 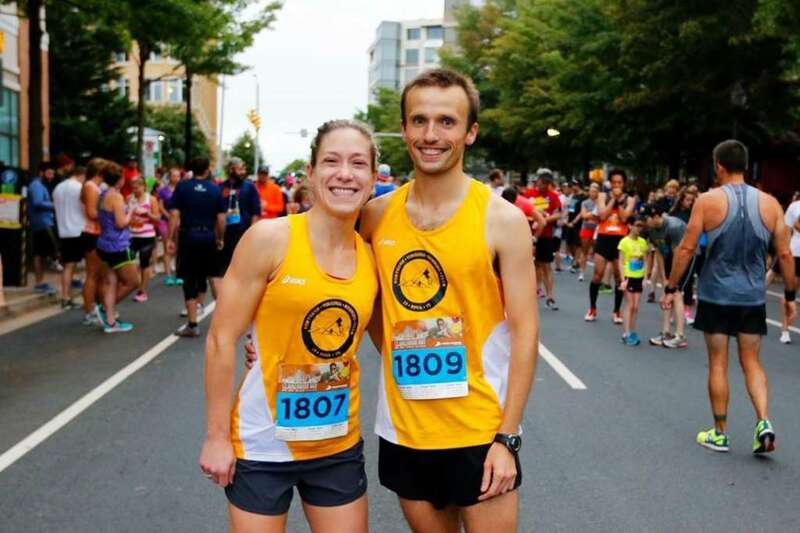 The two — who have been married for more than two years — met at Northern Virginia Running Club. They continue to be active in the group — even with the addition of their baby boy. Admittedly, the baby has led to fewer runs together, which occasionally necessitates a sitter. Other times, they work it out so they can both run, Erin said. “Now that we have a baby, running is a negotiation tactic. How much time do I have before baby gets up? How much time do you have before you have to pick the baby up?” she said. Hai Nguyen and Patricia Soumoff have a 15-month-old daughter and have found that their near constant runs together have dwindled. However when 36-year-old Nguyen and 40-year-old Soumoff — with marathon PRs of 3:09 and 3:05, respectively — find the time to go out together, their mentality has changed. Where does one meeting a prospective mate? Singles may check out the clubbing scene. For runners, that can mean run clubbing. Greg and Erin Swiatocha met at a Northern Virginia Running Club practice in 2014. Erin, who was president at the time, was delivery announcements at the beginning of practice, which included introducing the newbies — of which Greg was one. With the look of a lean, fast runner too skilled to stay with the running club, Erin gave him little of her attention, thinking he wouldn’t stick around more than one practice. Yet Greg stayed, in fact, bringing his membership check to the very next practice. One thing led to another and Erin found Greg sticking around for her after practice to do cool-down runs together. They chatted; they ran; they flirted. Before long they were dating. A few months later they moved in together. Less than a year after their first date, they got engaged. Greg said it was that first interaction with the running club’s president that fostered a bond with not only a love interest, but also a fellow runner. “She was really just enthusiastic, and enthusiastic about running and it gives you energy. That kind of drew me in a lot,” Greg said. 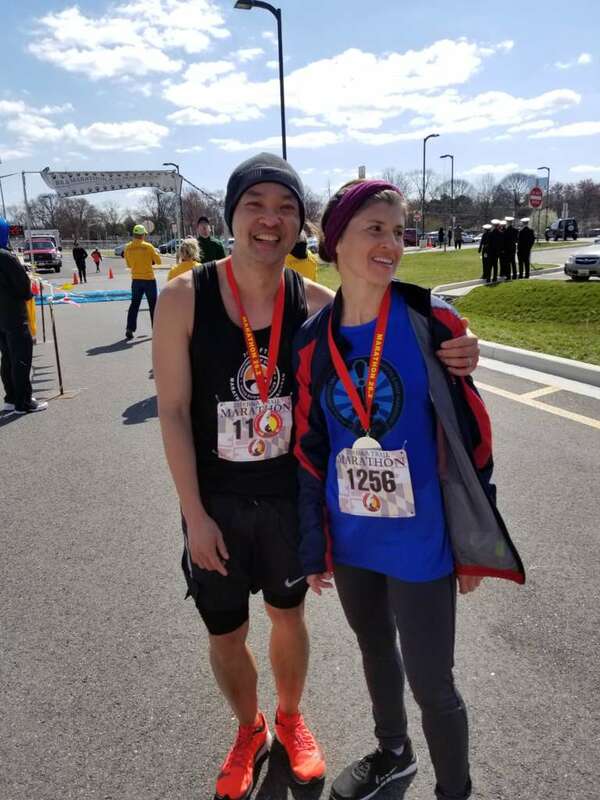 Hai Nguyen and Patricia Soumoff, who have been married for three years and reside in North Bethesda, met through the Montgomery County Road Runners Club. They joined the same training program and got to know each other. The connection came easy; the running maybe not so much, Nguyen said. Having a runner as a companion automatically meant that someone knew what you were going through and would be there to help you train and coach you through your journey, Soumoffsaid. “It was nice because running had already played a big part in my life and it was nice to have someone to share that with. It made our relationship seamless because now I had someone to share that with,” Soumoffsaid. Having a runner as a spouse means that a lot can go unsaid, said Luke Meyer and Hilary Moen of Silver Spring. It means having a partner who knows the physical and mental demands that come with training and racing, Moen added. “When he’s done with a long run on Saturday morning, he’s going to want to nap. I know that. And he know after I’m doing with a hard workout, I’m going to want to rest, too.” she said. “In general, it does help us anticipate how the other person is going to feel,” Meyer said. Meyer, 35, runs with Georgetown Running Club and boasts a 2:19 marathon best. Moen, 30, was a college sprinter and ran a marathon PR at Boston Marathon of 3:18. In their three years of marriage, running has been a good release from their day jobs — Moen’s as a systems engineer at Booze Allen and Meyer’s as an attorney at the Department of Interior. While their jobs can be stressful, both are understanding of the mental clarity running gives them. 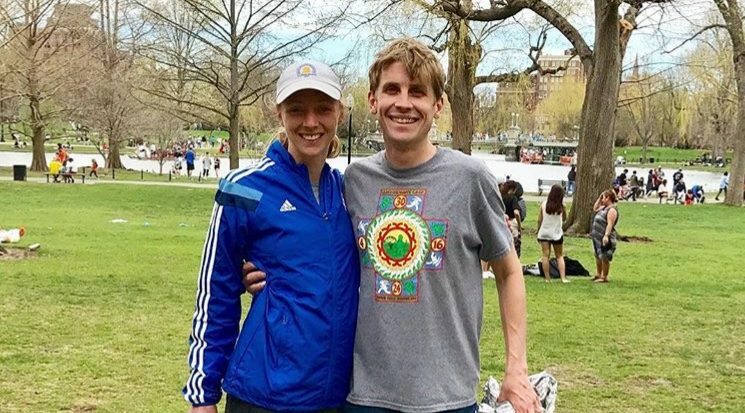 While running is a common thread in the lives of Greg and Erin Swiatocha, it’s not necessarily the center of their universe. “We don’t sit around and talk about running all night,” Greg said. “But we can!” Erin retorted. As the running couple evolves into running parents, they learn that balance is crucial — especially as they balance jobs, too: Erin works as the director of data analytics at Virginia Hospital Center and Greg as a patent examiner at Patent and Trade. “We have to support each ther because we wouldn’t survive this whole parenting thing without it,” Erin said. Mutual support for each other’s running passion was evident when Nguyen proposed to Soumoff. They both ran in the 2014 Marine Corps Marathon, and while Soumoffwas having an auspicious race, Nguyen was struggling. Soumoffcrossed the finish line thinking her boyfriend was not far behind her — yet he didn’t show up. She grew concerned, panicking as minutes ticked by. Finally he crossed the line, having been carried off the course by Marines at one point. When they reunited near gear check, he mustered his strength, bent to one knee and asked Soumoffto marry him. It’s hard for the Swiatochas to conceive a future where they’re not running. They imagine older age will take its toll and a potentially growing family will strain their time, but they acknowledge their fervor for running and their love for each other will allow it to blossom. “I can’t imagine [our future] would ever not include running. We will be probably run until we die. We may even die running,” Erin said. Meyer and Moen see a future filled with new races and supporting each other during them. Even if racing strength diminishes, they would like to continue running — and do more of it together. Running is a lifetime thing, said Nguyen, and he and his wife hope to share their love of running with their young daughter. “We want our daughter to do whatever she wants, but we’re hoping she enjoys running, too,” Soumoff said. And it sounds promising, Soumoff said. Her daughter may channeling a desire to lace up for a run.